Call of Duty: Online could be getting a battle royale mode. Footage from the game’s testing server surfaced recently, showing a beta version of an 18-player last-man-standing mode in the game, which is currently only available in China. They might have another competitor soon, but which is better – Fortnite or PUBG? The video above shows several aspects of the mode, which for the most part is standard battle royale fare, akin to what you’d see in PUBG or Fortnite. Significant changes can be found in player count, which is significantly smaller than many other genre mainstays, and in the way you enter the map – players choose a starting location and arrive on the ground, rather than parachuting in. Otherwise, they’ll start with nothing and gradually accrue loot, while a zone moves in over time, pushing players together, until the last player left alive is crowned victorious. The beta version of the mode takes place on a modded version of a Modern Warfare map, blown up to increase its scale. It’s a little sparse, especially with only eighteen players involved, but could be tweaked further to include more players in future. The mode surfaced in November 2017, and so far there’s been no further development. 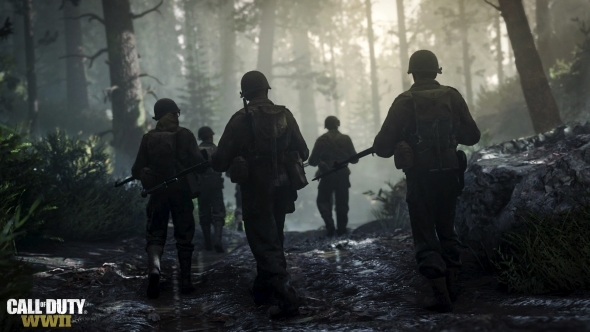 It’s unlikely that this would come anywhere near Call of Duty: WWII anyway, as while the historical accuracy of the game may not be the focus, battle royale probably has little place in a game about an actual war. It could be, however, that Treyarch include something like this mode in their upcoming COD game, rumoured to be Black Ops 4.